Lately, we’ve been working on giving you even better ways to find nearby places with Google Maps for Android, such as the Places icon and rich Place pages. Today, we are launching Google Maps 4.6 with a new design for Place page reviews, more options to filter search results, and a Google Latitude real-time updating option. 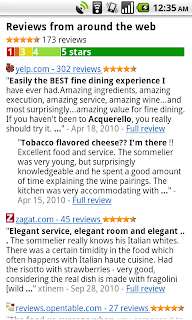 “Reviews from around the web” for highlighting sites that have high-quality reviews about the place. 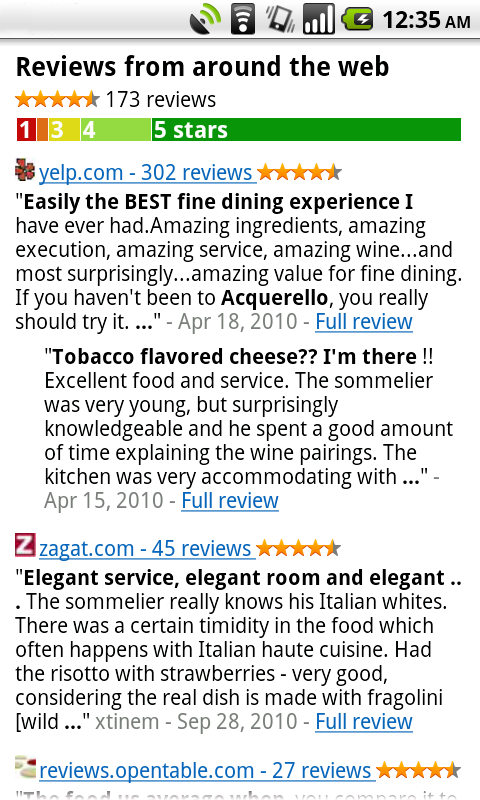 Find the right place with the updated reviews section (left) or search results filters (right). In Latitude, you can also choose an experimental “Real-time updating” option from an individual Latitude friend’s profile page to help meet up with them by temporarily seeing faster location updates (friends must have Maps 4.6 and Android 2.2+). Get Google Maps 4.6 for Android 1.6 and above everywhere Maps is already available. 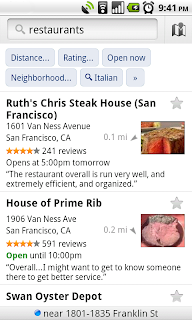 Just search for Google Maps in Android Market (or tap here from your phone). Visit our Help Center to learn more or tell us your feedback and questions in our Help Forum. The update isn't downloading on my T-Mobile G2 running Android 2.2. It just hangs there while saying "downloading..." but there's never any progress. Then it displays "download unsuccessful" after a while. This is the same thing that happens when I try to update Google Goggles. I've cleared the cache and data for all apps involved and rebooted the phone, but nothing works. I've read that uninstalling the app and then reinstalling from the Market fixes this issue, but I can't uninstall these apps because they're locked onto my phone. Google, do you have a fix for this? Others are also reporting market issues, myself included. I imagine it will be resolved some time soon. Same issue here. Come on Google... what's going on? There's a bug with the copyright text from the maps. It's always displayed on top of control buttons, that's a little annoying. When can we expect distances in Kilometres. I know there only 200 countries using Kilometres against 3 countries (Burma, Liberia, and the United States) using Miles. When will we have offline maps? If there's a legal reason why you can't, please state it. I would gladly pay a little extra for them. We still don't have Turn-by-turn in Australia. Just wonder when/if there is any plan/timeframe on this? Please please please make that d*mned search bar movable, especially in landscape mode. @JirikDrak - me too! If this has been a US-only feature, Google should have atleast mentioned that! On my HTC Tattoo, the update changed back to the old layot, where there isn't a search bar in the top and a "My position"-button, now I have to press Menu to go to that, and I also still only have rating and distance in my search results. I am gett]ting the same message : "download was unsuccessful please try again".and this is happening with every app and game that I am trying to install or update an existing app. This s happening since a month. Nice new features, but I've noticed that the Maps Live Wallpaper has stopped updating since the update. Also, the market indicating your position on the live wallpaper is missing. Anyone else notice this? 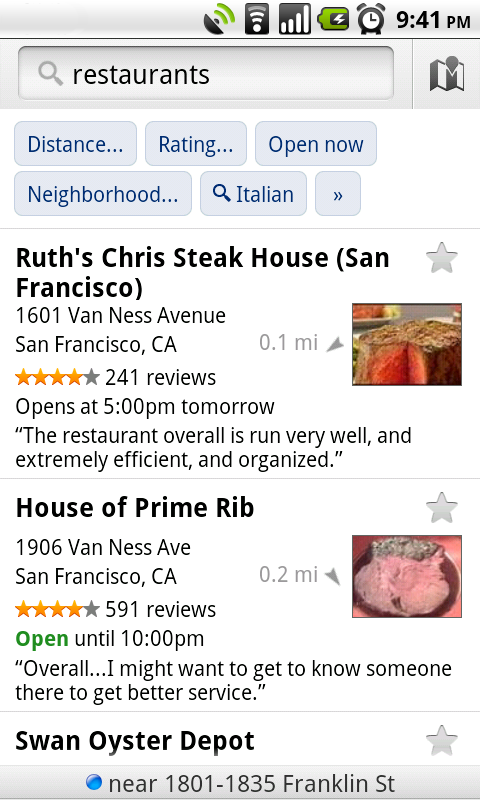 Can't wait until we can filter our starred places, or have them show up as a category in search! Is there any reason why the Android version can't have the 'north = up' option that the iPhone version has? Are different teams producing the various platforms' versions? The link is not working at all for me. I cannot find it by searching in the App store either. It says I can not do real time updating because of friends phone (which is my husband) and it is currently updated just as mine is. Is this just an Halloween trick from Google. Nice one guys. Gmail no longer auto updating since Tuesday afternoon. I've tried clearing data. Had the same problem, got notice of an upgrade for maps, tried to download, got stuck on "infinite download", eventually had to remove from upgraded apps. Hasn't come up for upgrade again, can't find a way to manually try upgrade. Please make live updating on latitude for 2.1 and lower. Not everyone has 2.2 and most phones are still waiting for an update from their manufacture. OK, I have a rooted Droid 2. As I understand it I can't remove latitude and places. I really don't want these icons under my apps and I am NOT OK with being unable to uninstall these without Google maps. Please don't ram apps down my throat. Please split this into 3 apps.